Father Bakaysa did not arrive at a very happy time in the history of our country. It was the time of the Great Depression. Economic stagnation not only gripped the nation, it affected the parish whose buildings started to show evident signs of disrepair. As one modern-day parishioner remembered, Michael Lazun, the men of the parish got together to do what repairs they could depending upon the layoffs and the reduced time in scheduling at the steel mill. Economic circumstances only began to change for the better in 1937. The first major financial break for the parish, however, was to occur upon the death on January 31, 1935, of one of its most devoted parishioners, Alexander Kish. He willed over half (over $8,000.00) of his estate to the parish with a view to the final construction of an upstairs church. With his munificence, the parish was now inspired to make a move toward the construction of a permanent church as previously envisioned many years ago. Besides a caring pastor, the parish was also blessed with a totally dedicated President of the Lay Council of Administration, George Dyondya, who went on to serve in this capacity for over fifty years until his death on January 11, 1986, at the venerable age of 83. As his own son, George Jr. remembers, his father never actually took a vacation with his family, but always arranged vacation time from Bethlehem Steel for the week before Christmas and Holy Week in order that he would be free to prepare the church for services and would be able to attend them himself. Serious meetings with an eye to a new church began in earnest in 1940. After consulting with the church counselors on numerous occasions, Father Bakaysa drafted the necessary resolutions and presented them at an open congregational meeting held on December 22, 1940. The decision of the parishioners to proceed with the project was unanimous. An architect, George Yundt, was contracted, and all construction documents were ready for bids in short order. In July 1941, the construction contract was awarded to Arthur Houser, General Contractor. Unfortunately, due to World War II, which was already in progress, even if not yet directly involving the United States, construction materials were hard to acquire, thus involving delays in bringing the project to final completion. Since the new church was ready enough for a temporary dedication on March 8, 1942, so services could immediate commence in the structure. In the meantime, all unfinished work was completed and everything readied for the Solemn Dedication of the Upper Church on Independence Day, July 4, 1942, by the Most Reverend Basil Takach, Bishop of the Exarchate of Pittsburgh. On that memorable day, the Silver Jubilee of the parish was likewise celebrated. It was thus for twenty-five years that the basement church was used for divine worship. For its part, the upper church was to be used for fifty years before transfer to the new parish facilities on Johnston Drive in June of 1992. The Silver Jubilee Book of the parish provides a valuable practical accounting of the project. With income from the Kish Estate along with parishioner offerings, each working parishioner was asked to contribute not less than $25.00. Other parish funds required only a $20,000.00 mortgage to complete the project. The total cost of the New Church Project, including architectural and contractor fees, related interior decoration expenditures, and some extra work done to the rectory came to just over $41,000.00. The mortgage was paid off in 1947. Since the country was fully engaged in World War II, the full decoration of the church was delayed. Two major projects were entailed. The first was the selection and installation of stained glass windows for the church. These were designed and executed by Payne-Spiers Studios, Inc., Paterson, NJ. From information contained in the Silver Jubilee Book, $4,525.00 was expended on these splendid windows. The bill for the extensive mural and freeze work done in the church in 1948 came to $14,370.55. Based upon letters in the parish files. over this aspect of the interior decoration project, the parish was financially embarrassed that the artistic firm contracted for the job, Walter Boettcher Studios of Brooklyn, NY, was not paid in full for a couple of years after the job was completed. Only during the administration of Fr. Alexander Punyko, who temporarily took over the parish until the death of Fr. Bakaysa in December 1949, was the issue corrected. With the interior renovation completed, a Solemn Rededication service could be held. This occurred on July 17, 1949, when the Most Reverend Daniel Ivancho came from Pittsburgh to attend this sacred matter. It was truly befitting that Fr. Bakaysa could see the New Church Project through to completion, interior renovation and all, before he himself was to be called to his eternal reward. Hospitalized on November 26th at Sacred Heart Hospital, Allentown, Father was to fall asleep in the Lord on December 4th. 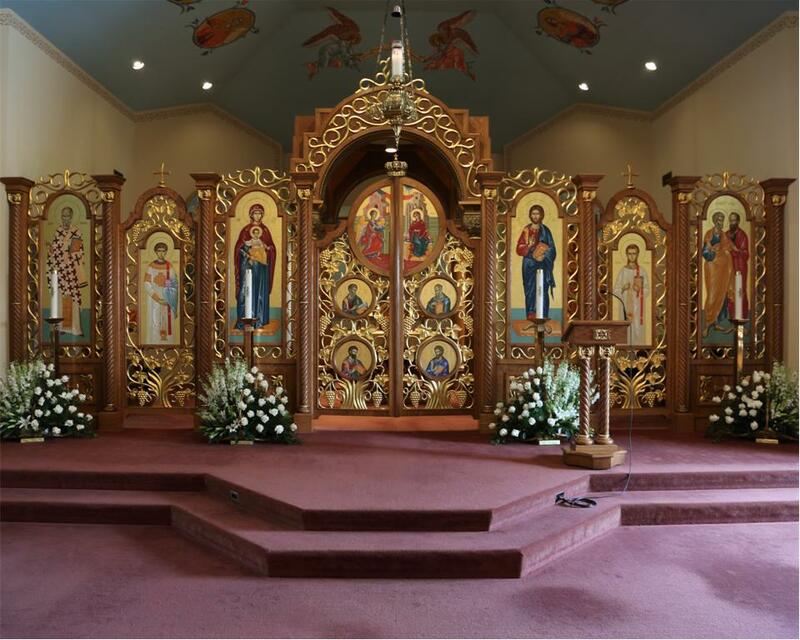 His funeral was conducted by Bishop Ivancho on Decembre 8, 1949, and was laid to rest at the parish cemetery of his “filialka” church located in Alpha, New Jersey.